Monday - Sunday: 9:30- 17:00. Get to the museum as the doors open, this way it'll be quieter and you might even enjoy some displays to yourself! We are comparing Australian Museum: Ice Age Mammoths Exhibition Sydney Entry Ticket Prices from leading ticket suppliers and Try to find you Cheap tickets prices on the market. Tickets to the Australian Museums temporary exhibition ‘Mammoths: Giants of the Ice Age'. The exhibition runs until 13/05/2018 and tickets are selling out fast. The exhibit showcases a life-size replica of Ice Age mammoths including a real baby mammoth that's over 42,000 years old. The baby mammoth was discovered in 2007 by a Siberian herder and his two sons, this is the first time the discovery has been on full display in the southern hemisphere. The exhibit also has interactive experiences including soundscapes and murals. The exhibit aims to bring natural history to life to educate visitors. The exhibition also covers issues including cloning of extinct species and conservation efforts for elephants. Great for families with young children. Perfect for historians or those wanting to learn more about the Ice Age. Your Experience With Australian Museum: Ice Age Mammoths Exhibition Sydney Entry Ticket? Explore the museums Ice Age exhibit. Take a look at the life-size mammoths. Learn about the Ice Age along with present theories and DNA explanations. Get up close and personal with the pre-historic exhibits. You can even touch some! Enjoy interactive experiences throughout the museum. Once you've explore the Ice Age exhibition, feel free to explore the remainder of the Australian Museum. What Australian Museum: Ice Age Mammoths Exhibition Sydney Entry Ticket Includes? Enterance to the Australian Museum. Ticket to see the 'Mammoths: Giants of the Ice Age' exhibition. Make sure you check out the interactive displays and listen to the unbelievable mammoth soundscapes! Travelers Reviews about Australian Museum: Ice Age Mammoths Exhibition Sydney Entry Ticket? 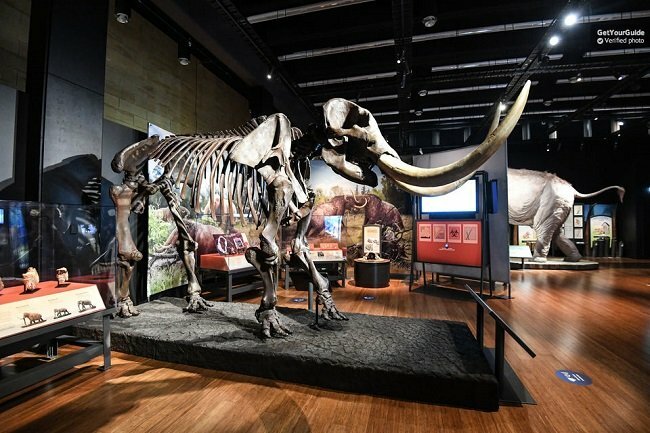 The Australian Museum: Ice Age Mammoths Exhibition Ticket has earned over 815 reviews and a 4-star rating on TripAdvisor. Travellers agree that this activity offers an educational experience for all the family. Most users claimed the museum provided a stress-free outing suitable for children of all ages. This tour is accessible for wheelchair users. Printed or mobile voucher accepted. Tickets booked through Get Your Guide can be cancelled for a full refund 2 days in advance. The temporary exhibition ends on 13/05/18 so make sure you book in advance. Australian Museum, 1 William Street, Sydney, NSW 2010, Sydney.